Peru is another great destination for lovers of wildlife. 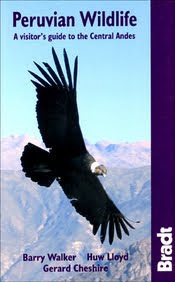 The full title of this Bradt wildlife guide is Peruvian Wildlife: A visitor's guide to the Central Andes, and that sums it up, for it is the Andes that will be the focus of any tour to this country. Indeed, this colourful (with over 220 photographs and clear colour maps) book mainly deals with the plant and animal species found at 3000m and above in 144 pages. Hotspots like Lake Titicaca, Machu Picchu and The Inca Trail are, of course, detailed and the are also sections on the Manu National Park and Inca traditions. This is a very useful pocket-sized guide.